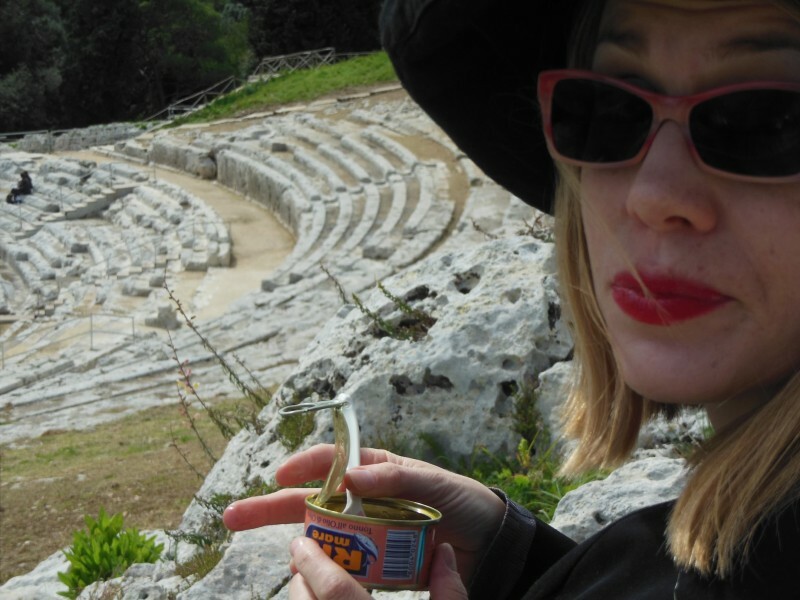 It’s not every day I can chow down on a can of tuna fish sitting in a theatre built in the 5th century BC, though as someone who has worked in and around theatres most of my adult life, I was thinking of mostly practical matters. For example: if this theatre sat 15,000 or more people, where did they go to the bathroom? Were there concessions? Did people by tickets? How did they get there–like, did they have chariot parking or something? 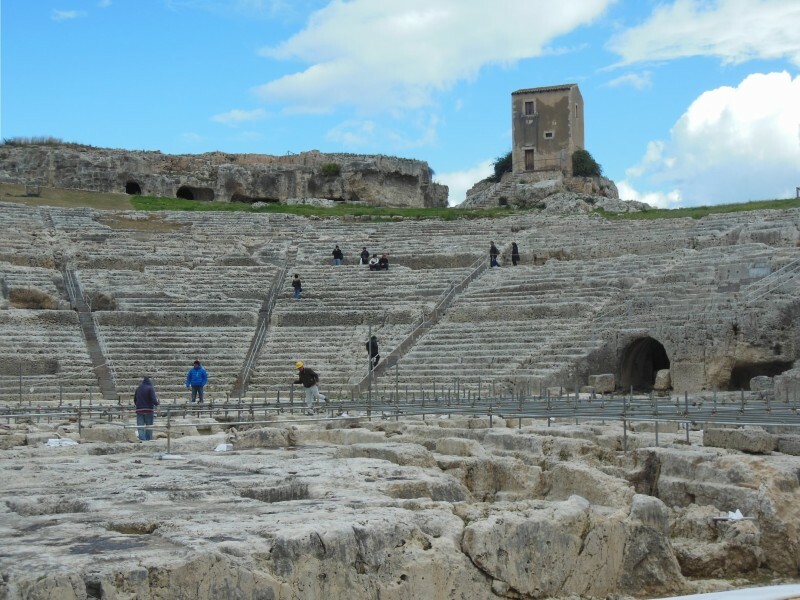 The very first performance in the Greek theatre of Syracuse in Eastern Sicily was an Aeschylus play, Women of Aetna, in 478 bc. Soon after Persian Women, also by Aeschylus, was also premiered there. (You classics nerds just felt a little tingle in your toes, didn’t you?) The seats are carved right into the rock of the hill it sits on, and apparently it has such perfect acoustics that classic plays are still performed there every summer without amplification. 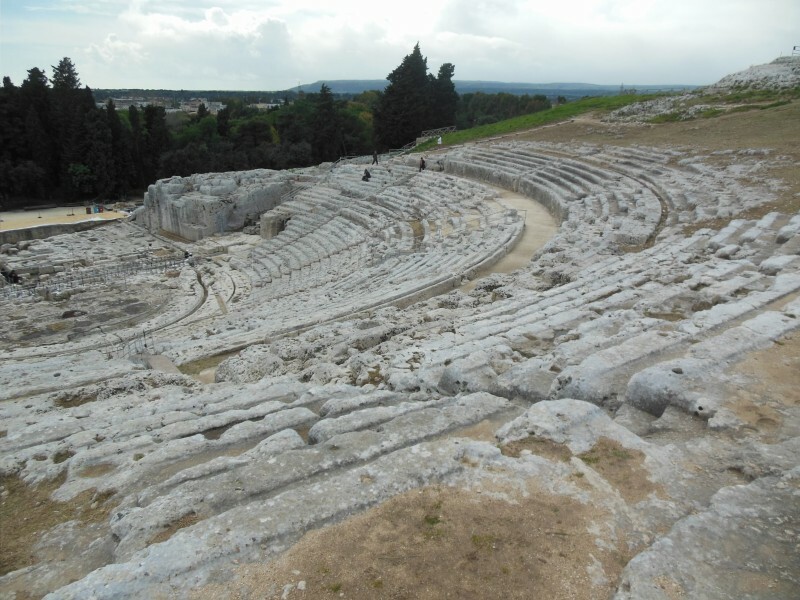 The Greek theatre is inside Syracuse’s Archaeological Park, which has other Greek and Roman ruins. While the sights are well worth a visit (and are UNESCO protected), you shouldn’t tour the park without bringing a guide book or similar research. Outside of the park is tacky jumble of huts selling the usual tourist-trap junk. Inside the park, there are hardly any signs and no explanatory text. Fortunately, I was carrying a binder full of notes, or I’m afraid we would have been standing around going “Oh wow, that looks really old.” Hey city of Syracuse, if you’re listening: you have a gorgeous town full of priceless works of human heritage. How about a few brochures and detailed signs to go along with the huts of key chains and souvenir magnets? You’ll make some classic nerds very happy. How we got to Syracuse: train from Ragusa. Where we slept: Hotel dei Coloniali Price: €55 for a double. Recommended: yes.